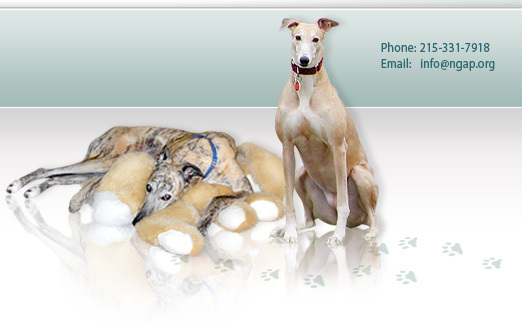 National Greyhound Adoption Program welcomes your dog in our boarding facility 365 days a year. 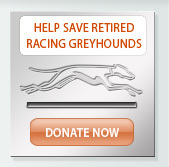 We currently board many greyhounds (and their non-greyhound friends) annually. We have a caretaker on the premises 24-hours a day and our building is fully equipped with a smoke and fire detection system as well as interior and exterior surveillance cameras. We have kennel staff on-site daily from 6am-10pm with the exception of a few intervals of down-time when the dogs are left to rest and relax in peace. We have staff veterinarians on-site every Tuesday and Friday should any medical issue arise. The comfort, care and safety of your pet is always our first priority. 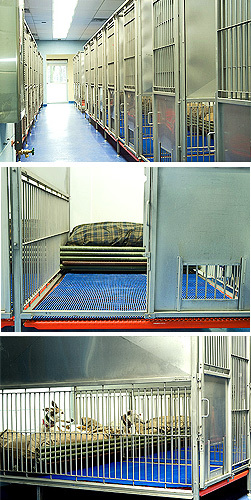 Dogs enjoy a clean and comfortable, climate-controlled kennel. Your dog will be housed in a run of approximately 4' x 6'. Our runs have raised floors consisting of rubber-coated metal grating with an additional rubber mat over the grate. In the back of each run, there is a large raised area complete with fluffy bed! Guests are sprawled-out or belly-up on these beds in no time! As an added detail, our ceiling light panels are superimposed with a bright blue sky with clouds to bring the outside in, even on the rainiest of days. Soft music plays continuously. Our three interior turnout areas and our 'Senior Room' can also be reserved for boarding, when available. These rooms provide a clean, large open area for multiple dogs to rest, play and be fed in. Dogs are allowed free reign in these areas and socialize with each other or snuggle together. Comfortable bedding is available at all times. For dogs that need to eat separately, crates can be set up for feeding time only. We suggest these areas for families of dogs that are boarding or for senior dogs who may have trouble getting in and out of our regular runs. The cost to reserve any of these areas is $20.00 per day, per pet family, in addition to our regular applicable boarding charges. These areas will be reserved on a first come, first served basis. Your dog will be muzzled and let out in groups to run and play with other greyhounds four times a day in either one of our three interior turnout areas (during inclement weather) or in one of our two large 20 x 100 ft fenced-in outdoor boarding area spaces. We recommend that you bring an adequate supply of your dog's regular food in an airtight container (no plastic bags, please!) along with any medication (with administration instructions) that your dog may need. The administration of medication is subject to a $2.00 per day fee. Normally, our boarders are fed twice a day but if your dog is a finicky eater or has a unique eating schedule and/or diet, please let us know! Because of the large amount of dogs, bedding and toys in our boarding kennel and adoption kennel, we do not permit any personal items other than food. Always leave phone numbers where you and your veterinarian can be reached in the event of an emergency. 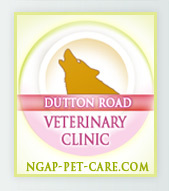 If your pet should require medical attention while in our care, we will contact your veterinarian. Please inform us of any special routines, habits and/or personality traits your dog may have so that we can make your dog's boarding experience as enjoyable as possible. Although your dog will be treated to nail clipping and ear cleaning, boarding time is a good time for dental cleaning, vaccinations and other clinical services. Bathing is also available at $20.00 + tax.